Stress is defined as being any stimulus that you experience in your life that challenges your wellbeing. Although a negative connotation is attached to the term, stress can be either positively motivating or threatening. The amount of stress in your daily life can either help you, or can be damaging to your mental or physical health. So, the question we should all ask ourselves is this: Stress, is it manageable? The short answer to this question is, yes. There are a number of different ways, both chemically and holistically, that you can use to manage your stress. It's important to note that stress cannot be avoided or eliminated, since you will always come across stressors that induce stress in your daily life. Management of stress merely helps you cope with these stressors so that living your life will be a bit easier. The science behind stress is quite simple, but is important to know if you want to understand stress management. When the body feels threatened or excited by external stimuli, it produces large amounts of cortisol, adrenaline, and noradrenaline. These hormones work together to spark the "fight or flight" response. This is the sympathetic nervous system's reaction of an animal's need to survive. During the "fight or flight" response, the body produces more sweat, heightens the heart rate, and the brain becomes more alert and heightens muscle response. All resources are directed to this survival response, and other functions that aren't essential in that moment are slowed down. This includes less attention to the immune and digestive systems. When the brain is excited by stressors, it sends signals to the adrenal glands to release adrenaline. Adrenaline in turn causes a spike in blood sugar, which raises your heart beat and blood pressure. This creates the hyperawareness and panic often associated with stress. Simultaneously, cortisol is released from the adrenal cortex when the hypothalamus sends signals to the pituitary glands. Cortisol, also known as the "stress hormone", maintains the blood sugar and pressure levels caused by adrenaline. It is an essential hormone for your body's "fight or flight" response. There's no doubt that stress can be positive. It manifests when you need to be hyper alert to a school assignment that is due the next day, when you need to concentrate on arrangements the day before your wedding, when you need to cover all your bases before an important work presentation. However, studies show that an overload of cortisol can actually kill brain cells and damage the hippocampus region of your brain. Although the body does need a certain amount of cortisol to survive, too much can leave you susceptible to stroke, mental anguish, and other stress-related diseases. Therefore, we refer back to the most important question. Stress, is it manageable? Consult a doctor for medicinal treatments, or actively seek holistic ways to cope with the stress in your life. 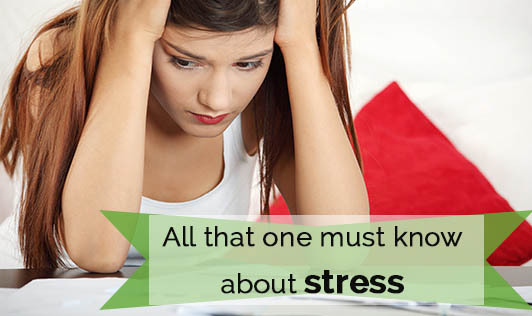 Stress not only affects your mental well-being, but physically as well. Try and reduce the amount of stressors you expose yourself to. And manage the ways you deal with all the stimuli around you so you can stay both mentally and physically healthy.